With every passing day the date for the Commonwealth Games hosted by the city is drawing closer. Let us be insight-fully honestly truthful about this incredible speed of physical infrastructure development that is taking place in our city and its impacts on human beings and environment, both positive and negative that is happening and will continue to happen. But this is not what I want to focus on today. I want to state a purely speculative hypothesis about the Commonwealth Games (CWG) as part of and event that happens in a World System over which individuals – be it political leaders or even countries have very little control. There is a hidden law governing the Global Systems across the world. 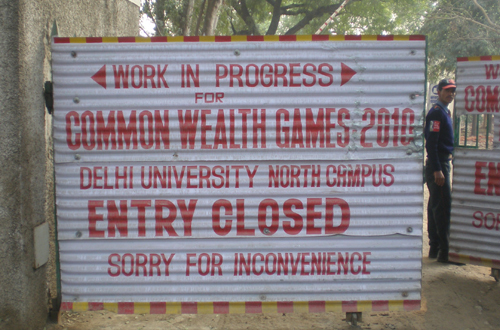 Here is a possible explanation at the global socio-economic and ethnic religious factors that may have played a role in the choice of Delhi as a Commonwealth Games site for 2010. Following are possible questions, when truthfully answered will provide us some answers to why Delhi was chosen, but this is a different level of discourse, so be patient with me. What is the conversation that constitutes the agreement about success of the CWG? Games are secular events as against religious or ethnic events. The successful hosting of global secular events like the CWG causes socio-economic development and ethno- religious openness making the city a Global city. What is the consensus that the political and bureaucratic authority believes, that constitutes the construction of the CWG to take place in Delhi in one and a half years time? There are agreements over what a city/ country that hosts such a world event should look like. They seem to be cities countries that are aspiring to world development, it would be interesting to find out what this appearance of reality is and it is very strong. The more you resist that agreements of such city exist, the more you create legitimacy for the criteria for such cities exit. What are we struggling with? We are struggling with socio-economic consensus over hosting of these games. In our country such kind of money could have been used for the social welfare of our poor. Why should we bother to host such events successfully particularly in the face of terrorist threats? “Nothing succeeds like appreciation of success” Agreements about success are temporary but they have a lot of power. so many fundamental issues to be tackled – the city is a mess – lining up resources for something as superficial as this..
We really cannot stop things from happening. common wealth games will help city grow and will result in better infrastructure. The city dwellers should focus more on how to avoid any environmental damage that might have taken place. The key area of focus has to be Yamuna river. The river needs to be saved. The water shortage in the city will disappear if all of us come together with NGO’s and do our bit.